Could you imagine our cities without the provision of zoning controls dictating where you live and how you should develop your site? Does it look like site specific heaven or a metropolis chaos? Would you sacrifice it for more affordable housing? Earlier this month, the Reserve Bank of Australia, who we all know and love published a research paper inquiring further into the consequences of zoning laws on housing affordability, particularly in Sydney and Melbourne. The paper calls for a fundamental rethink of government policy, stating that zoning "had driven prices substantially above the supply cost," with estimates “that the average Sydney house, valued at $1.16 million in 2016, represents a $395,000 structure on a $765,000 block of land,". This represents 36% the true value of that land and 64% the cost of what the RBA calls the Zoning effect. Among the worst affected areas were Willoughby and the Northern Beaches in Sydney and Boroondara and Stonnington in Melbourne, where prices on the median house have been driven up by more than $700,000. The paper uses the example of Wyndham Vale, a 363 hectare site 40 kilometres west of Melbourne, which was recently rezoned from rural to residential and has thus spiked in value from $120 million to $400 million. The RBA provided an analysis saying that “such large increases in values as a result of zoning changes are inconsistent with the ongoing debate that a physical shortage of land itself is the main cause of high housing prices”. This is not to say that we should just abolish zoning all together in order to afford a place to live, (without compromising your Saturday morning full milk cap and smashed avo!). Without strategic zoning provisions, we’d be living in a developer monopoly of a Blade Runner-style urban landscape, but hey, housing would be cheap as chips to buy! ….right? If a Blade Runner future isn’t quite your thing for you and your family, that’s probably because zoning laws were created for just that very reason. Even the RBA admits it. Zoning rules mean we pay higher prices but we get a bit more breathing room to live in. Putting a price on your precious amenity can often be seen as a luxury within our nation as we have the opportunity to housing choice and style. More square meterage for your family, direct natural sunlight light in your homes and perhaps a bit more beauty? 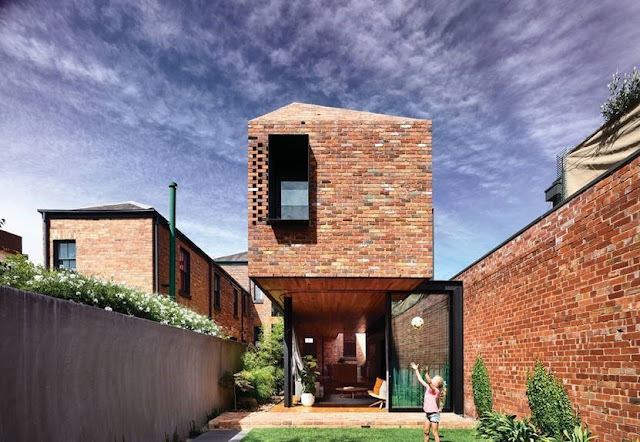 Zoning ensures that you can obtain a sizeable home on a nice leafy street with a big yard - the great Aussie Dream. It can all be yours for a seductive starting price of $1.16m (and probably the next 45 working years of your life). Of course, a Blade Runner city concept would only apply to the more valuable land assets with close proximity to services, transport and places of employment. 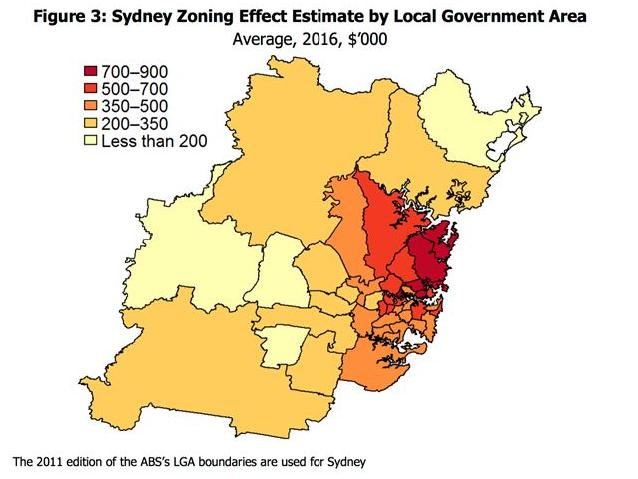 The below figure indicates higher housing prices in Sydney as a result of The Zoning Effect. The big question is whether higher house prices as a result of zoning provisions are really worth it? The mental health impacts of the high cost of housing is an unstable and worrying torment of ongoing survival to a human life. Two working parents spend the prime of their lives working to pay off an inflated mortgage, spending time away from their kids, ruled out dreams of travelling or pursuing their hobbies. Do we really get more benefit from a detached dwelling house and a front yard than we would from 15 years less mortgage? OPINION: Personally, I’ve always believed front yards are an obsolete requirement for land use. Rarely do people realistically enjoy their front yards, yet spend time and money on ongoing upkeep. This is not to say that there shouldn’t be a distance of separation between the street boundary and your front door, there should always be a setback of space to indicate public and private property however, additional housing square meterage or rear private outdoor space would be more beneficial, liveable and sustainable. The real question is whether the costs of our planning rules outweigh the benefits for the livability of the future both our individual happiness and the sustainability of the city’s landscape.